With a coastline of 7,000km, 14,500km of navigable waterways, and 12 major ports, the story of Indian maritime has long been one of unfulfilled potential. Most estimates put India’s contribution to world trade through shipping in the region of 7-8%, but as a shipbuilding nation it has long lagged behind the powerhouse nations of East Asia. In the pre-crash era of 2002-2007, with the help of a government subsidy programme, India accounted for 1.24% of global shipbuilding orders, according to figures published by India’s Shipping Ministry. However, the end of this scheme, coinciding with the 2008 financial crash, saw production plummet to just 0.01% by 2012. Since the recession, Govil says, Indian shipbuilding has largely survived on naval and defence contracts. Of the 27 shipyards in India, seven are state-owned and focused on the defence sector. 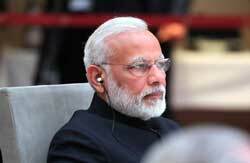 Renewed impetus came in 2014 when, as part of his larger ‘Made in India’ initiative, Prime Minister Narendra Modi announced ambitious plans for the Indian maritime sector, including the 10-year Shipbuilding Financial Assistance Policy (SFAP). Under the SFAP, formally launched in 2016, shipyards receive up to 20% of the cost of a ship, irrespective of its size or type, upon construction and delivery of the vessel. Unfortunately, says Govil, the policy has made little impression in reversing the prolonged downturn and Indian yards are still struggling to win orders. An additional policy, tentatively announced by the government in 2017, set forward a strategy that would have doubled India’s shipbuilding capacity and seen increased focus on niche shipbuilding capacity, with the aim of positioning India as a hub for LPG, LNG, cruise and chemical tanker production. The groundwork had been laid two years earlier, when the state-run Cochin shipyard signed a collaboration agreement with Samsung Heavy Industries (SHI) of South Korea, which would have seen Cochin workers trained in LNG shipbuilding techniques. However, the plans were contingent upon the requirements of GAIL (India) Ltd, the state-run gas firm, which had indicated it needed up to nine new vessels for the export of gas from the US. When GAIL subsequently determined it was more cost effective to source its gas from elsewhere, and delegate transportation of the gas to those suppliers, the Cochin/SHI arrangement no longer served a purpose. “In my personal opinion it may be difficult to double the size of shipbuilding industry in India by 2022 unless the position improves,” laments Govil. Yet, as the opening of the Centre of Excellence in Maritime and Shipbuilding (see p.28-29) demonstrates, it’s by no means all doom and gloom for the Indian maritime sector, even if it may take some years to start reaping the rewards. Moreover, India has no shortage of expertise in marine engineering and ship design. Putting forward the naval architect’s perspective, Pratibha Sawant, CFO for Indian-based Buoyancy Consultants, stresses that shipping is ultimately a global industry: “As design engineers, we have no limitations as we are location neutral. India still accounts for about 3% of our total revenue. While the number of design firms registered here is about eight in all, the majority of their clients are overseas. The sheer volume of work and cost economics from more mature markets are as-yet unparalleled,” says Sawant. Sawant points to the Sagarmala Project, the government’s US$120 billion initiative to unlock the potential of India’s inland waterways through new ports and coastal communities, as a major source of encouragement. In addition, there are the opportunities afforded by the Ballast Water Management Convention and 2020 sulphur cap. “Given that yards are being booked across the globe will lead operators to carry out retrofits in India over the next three quarters,” he notes.